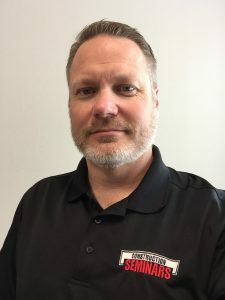 Wade Airheart, owner and instructor at Construction Seminars, Inc., has had 20 years of experience with Contractor licensing. Over 30,000 students have come to Wade for instruction and help in receiving their contractor’s licenses in both New Mexico and Texas. Wade has years of experience in construction code, sales, marketing, advertising, employee management, and business management. During his 25 years of business ownership, Wade has owned a contractor’s licensing company and an insurance company. He has owned and operated a payroll company which also handled employee benefits. Currently, Wade owns and manages companies in two states. His skills and experience in management led him to author a video series entitled “Success in Business.” He has held a New Mexico Contractor’s license since 2003 and has been a licensed insurance agent since 2005.
several businesses, including two in the new construction and remodeling industries. He is a licensed GB98 contractor and holds his ICC Residential Electrical Inspector’s Certificate. Bob has been an instructor with Construction Seminars for nearly a decade and teaches all of our Electrical Test Preparation courses, Electrical Continuing Education classes, and many of the GB classes.